When Neil and I first met, we both brought some of our own food traditions into our relationship. And with Neil’s half-Italian background (and the fact that both of his parents are amazing cooks) there were a lot of delicious and simple classic Italian recipes and techniques that he brought along with him – the most important being homemade tomato sauce. I’m not talking about some secret family recipe that takes slaving over for hours. 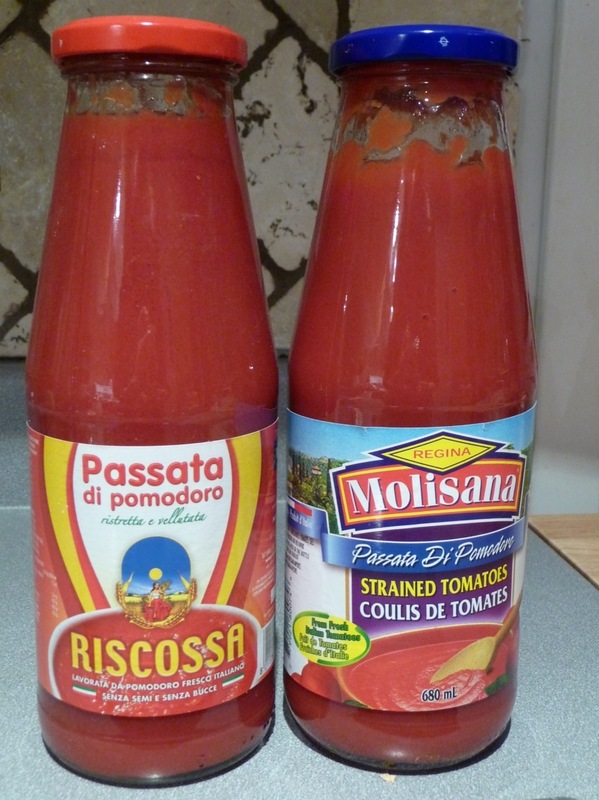 The tomato sauce that Neil taught me to make from scratch is so simple, easy and quick that I can’t believe I ever used to buy prepared jarred sauce (and I never will, ever again!). Of course we sometimes alter the recipe, but the basic ingredients are always there; olive oil, fennel, shallot, strained Italian tomatoes, basil. 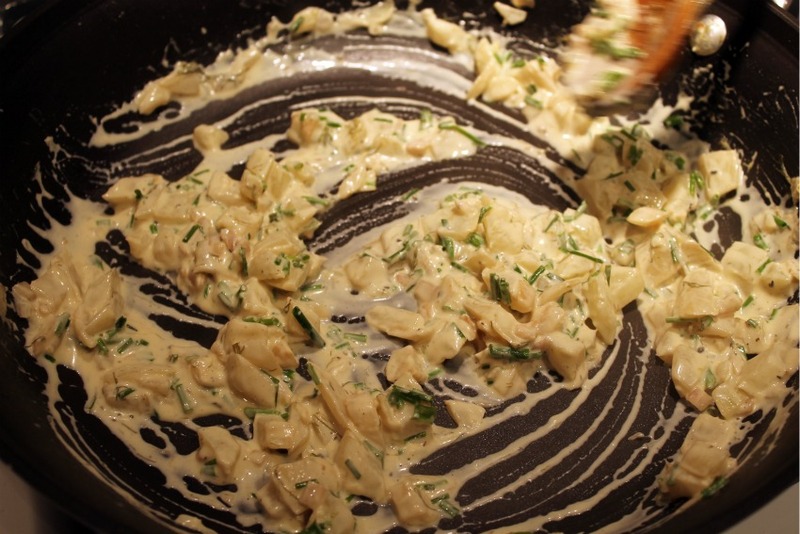 The fennel is essential to the sauce because it adds sweetness and richness. 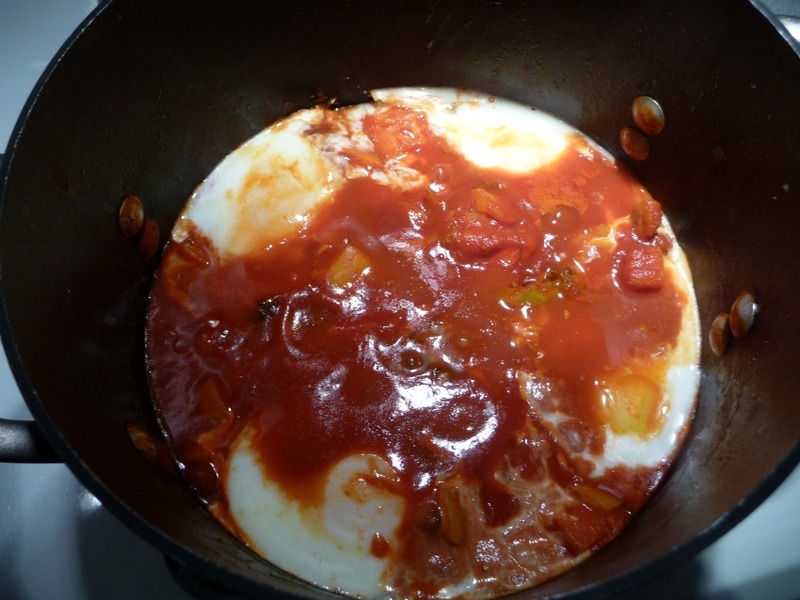 And this simple sauce is the base for one of our favorite comfort food meals: Eggs in tomato sauce. Neil’s dad used to make this dish for him when he was a kid and I know that it’s a recipe we’ll keep making forever and pass on to our family. We make it all year long, but it’s a weeknight staple when the weather turns cold. It’s everything I crave on a chilly, wintery night. 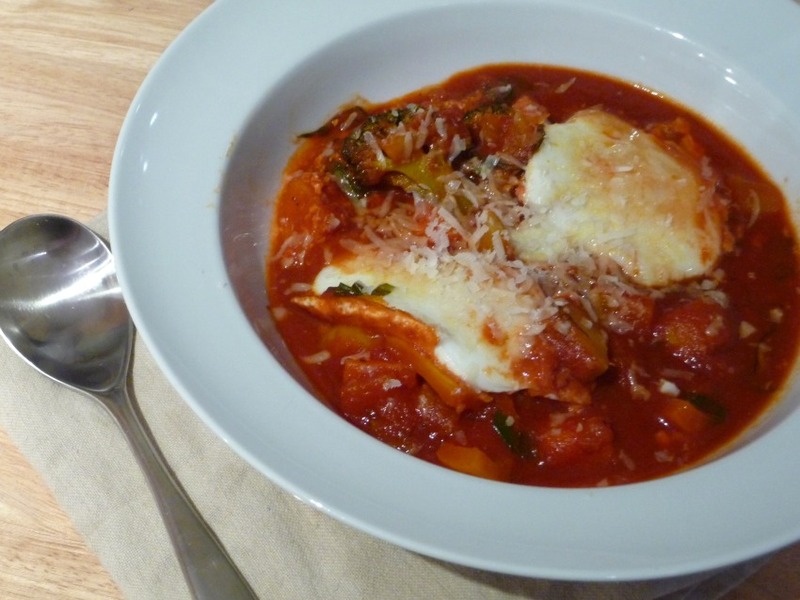 We used to make a simple sauce with eggs poached inside and eat it all with crusty bread. 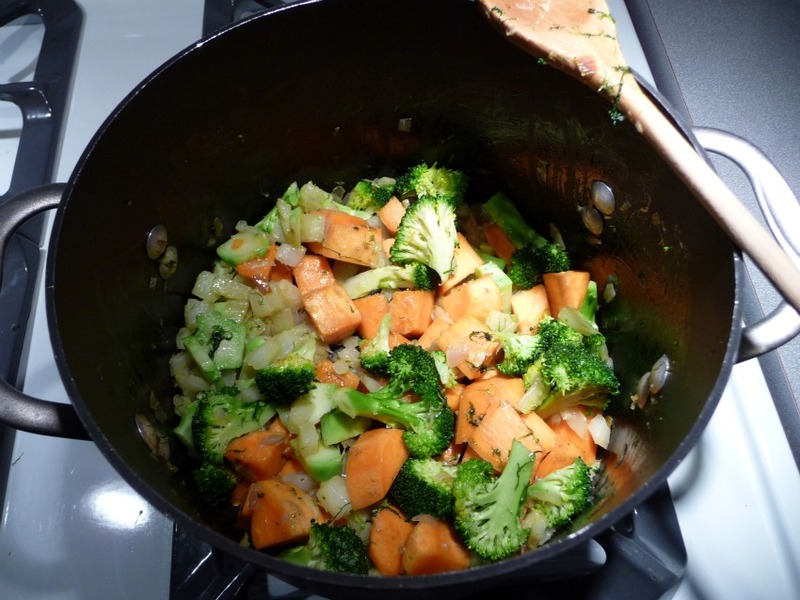 But eventually, as we evolved the recipe, we started adding vegetables and sweet potatoes and now it’s become a satisfying and full meal (no bread needed, though it’s always a bonus treat and handy to sop up all that leftover sauce in the bowl!). 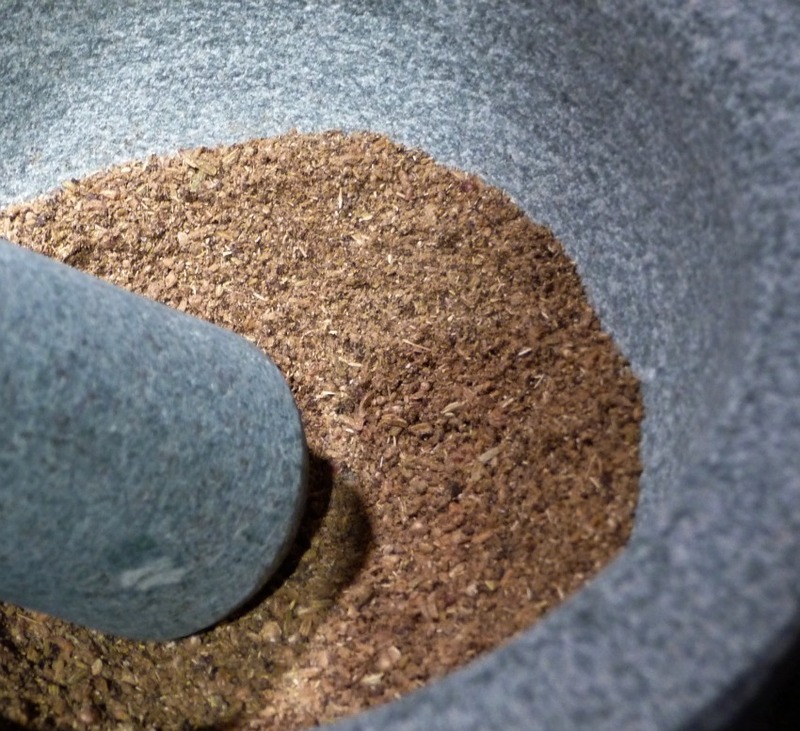 There’s a similar Middle Eastern dish called Shakshuka where the idea is the same but the spices used are much stronger and the flavors are completely different. Neil and I can’t seem to stray from this version though, where the Mediterranean flavors are so fresh and simple. It may look like you’re eating a big bowl of plain old sauce, but this dish is really more like a stew. It’s rich, savory, a little sweet, layered with flavor and so comforting. The eggs take more or less time depending on how you like them cooked. 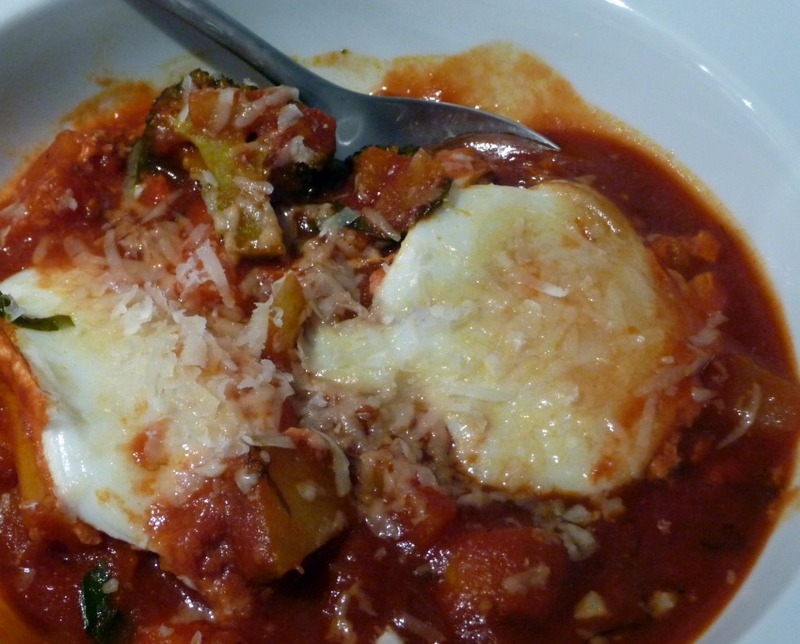 Neil likes his a little runny so he can mix the yolk into the sauce for added richness. I like mine cooked a little more so that the yolk is just to the point of holding solid and a little gelatinous but not hard. You can usually tell by looking at them and touching them lightly with a spoon. * note: You can add any veggies you like or omit them completely. 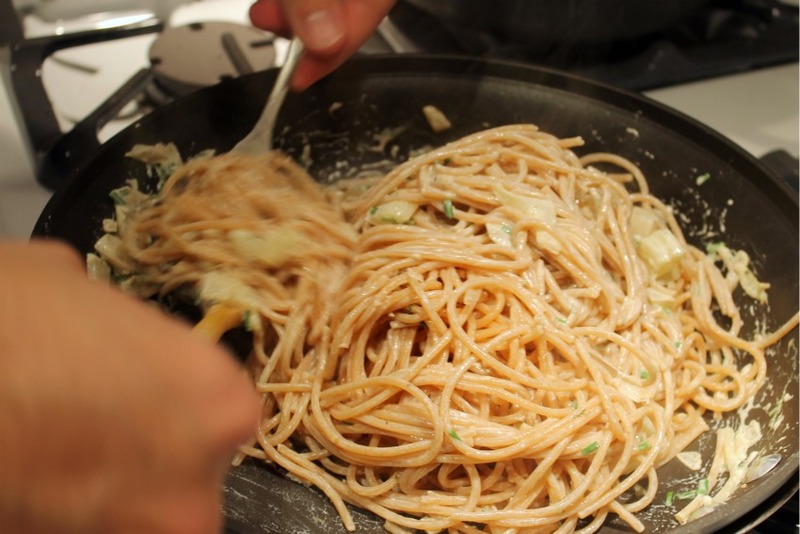 But either way, you need to make the basic sauce with the fennel and shallot as a base. Heat a good amount of olive oil in a deep pot and add fennel (with fronds) and shallots. Add some salt and sauté on medium heat for a good 8-10 minutes to bring out the sweetness. Add the sweet potato and cook for a few more minutes. Add the peppers and broccoli and cook for another minute or two. Add the entire bottle of tomatoes and a little bit of water (I add a bit of water to the bottle and swish it around to get every last bit of tomato). Add the basil and some salt and pepper and mix well. Add a splash of balsamic vinegar for flavour and to ensure that the eggs poach properly. Bring the sauce to a boil then cover, reduce the heat and let the sauce simmer. Simmer the sauce for a minimum of 15 minutes to let the flavors come together. 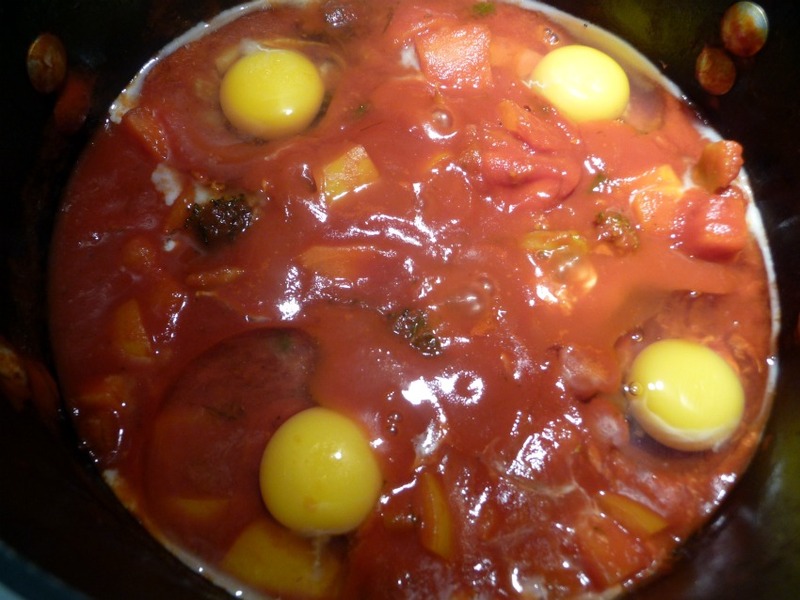 At that point, you can keep simmering to deepen the flavors or (if you’re really hungry) you can move on to the eggs. Taste the sauce before adding in the eggs and make sure you’re happy with the amount of salt and vinegar. Turn the heat to low. I always crack my eggs into a small bowl and then slide them into the sauce from there. And I sort of carve out little trenches in the pot for each egg to sit and cook without interfering with each other. Cover the pot and cook on low heat for approximately 10-15 minutes, making sure to check on them every few minutes to see how they’re cooking. Once the whites turn solid it’s just a matter of how you prefer the yolks to be cooked. I usually try to take Neil’s out first so they’re gooey and runny and leave mine for longer so they’re a little more solid and gelatinous. 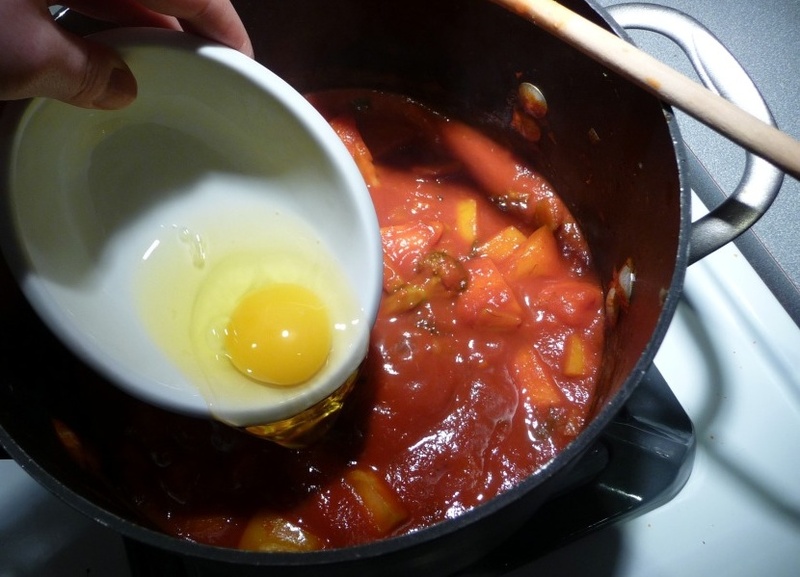 Using a soup spoon or ladle, transfer the eggs to big bowls and surround them with heaping amounts of sauce and veg. 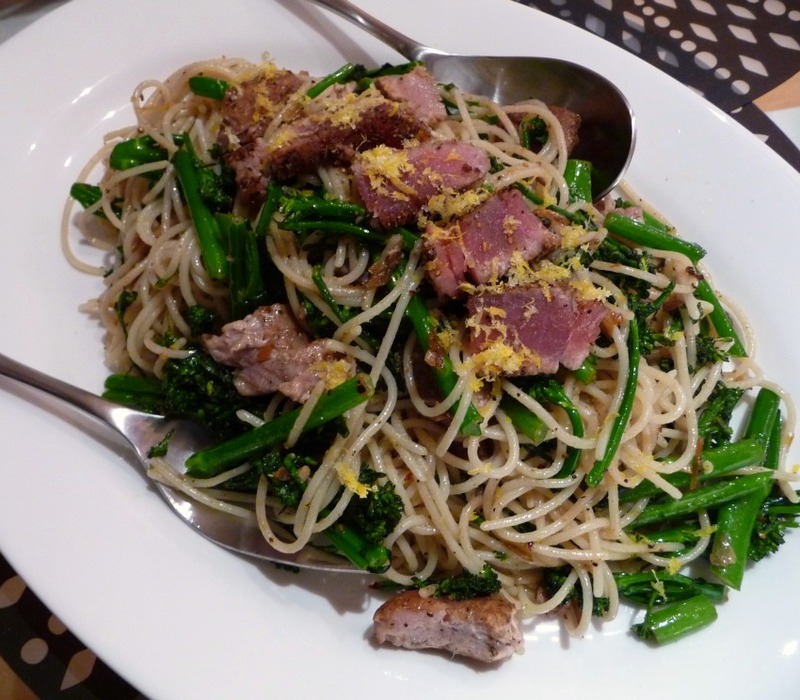 Top with freshly grated parmesan cheese and more salt and pepper, to taste. This may seem like a hassle but I promise you, it takes hardly any effort once you get going and it’s so worth it. 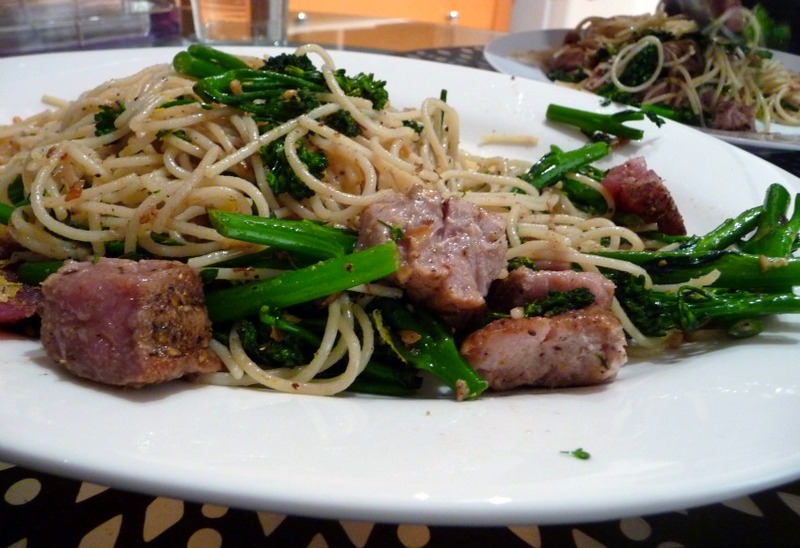 You’ll definitely have leftover sauce which you can use the next day mixed into pasta or even just on its own. I threw a can of kidney beans into my leftover sauce and ate it cold for lunch. Molto bene. 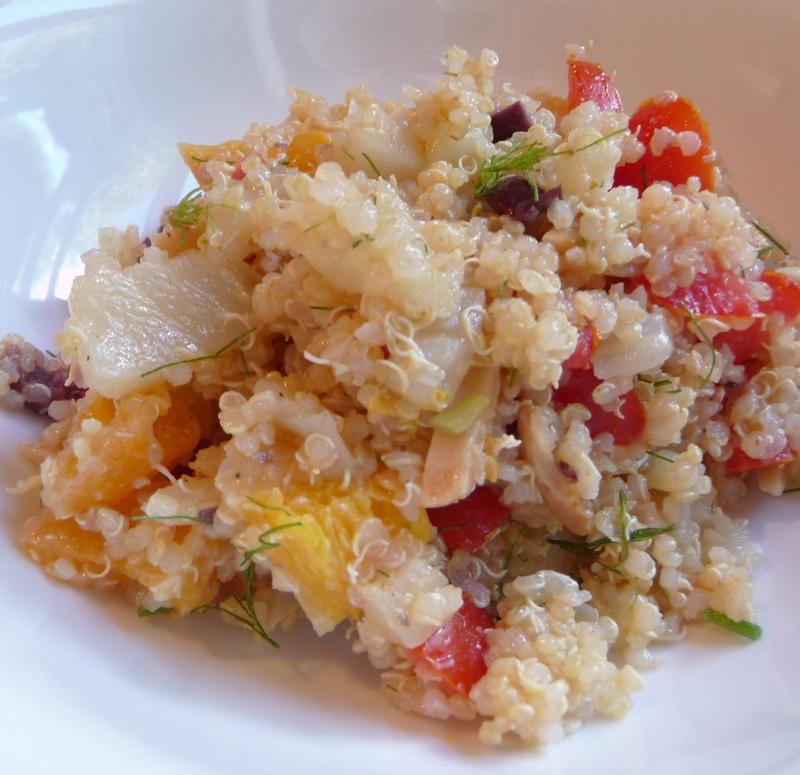 Quinoa is one of my favorite foods and I’m always looking for new ways to spruce it up. I came up with this dish based on a salad I quickly threw together a few weeks ago with tomato, orange and olives drizzled with olive oil and salt. 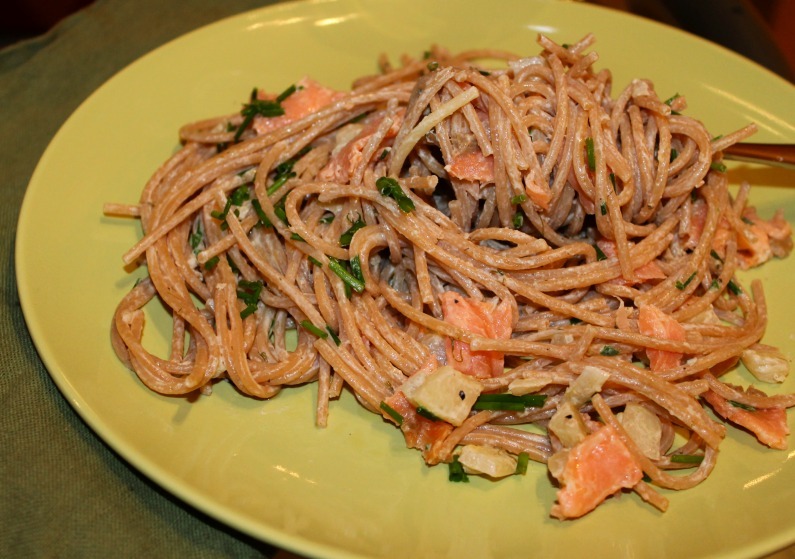 We ate the salad with some sautéed fennel and a piece of salmon and the combination of flavors on the plate were perfect. Fennel is delicious no matter how you eat it, but something magical happens when you cook it down in a little bit of olive oil and really let it get soft and sweet. 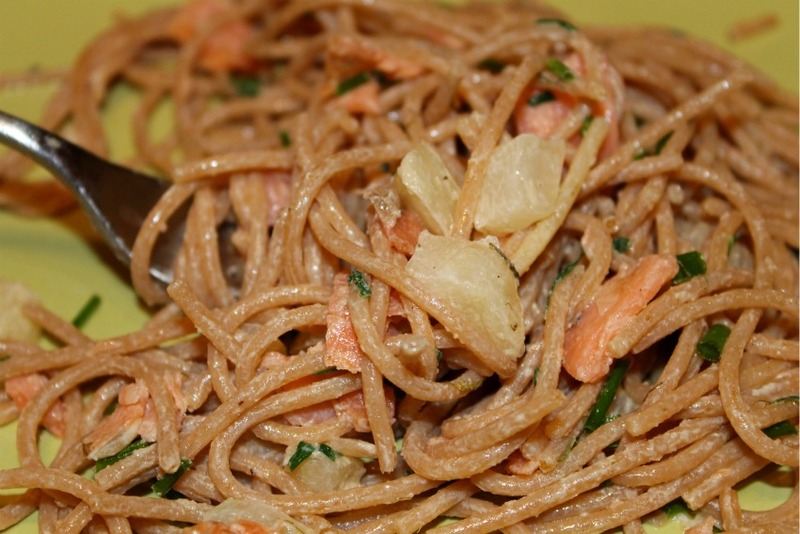 It becomes rich and almost creamy and full of flavor. Neil has been adding a touch of fennel pollen to our sautéed fennel these days, and it really helps add depth to the flavor. 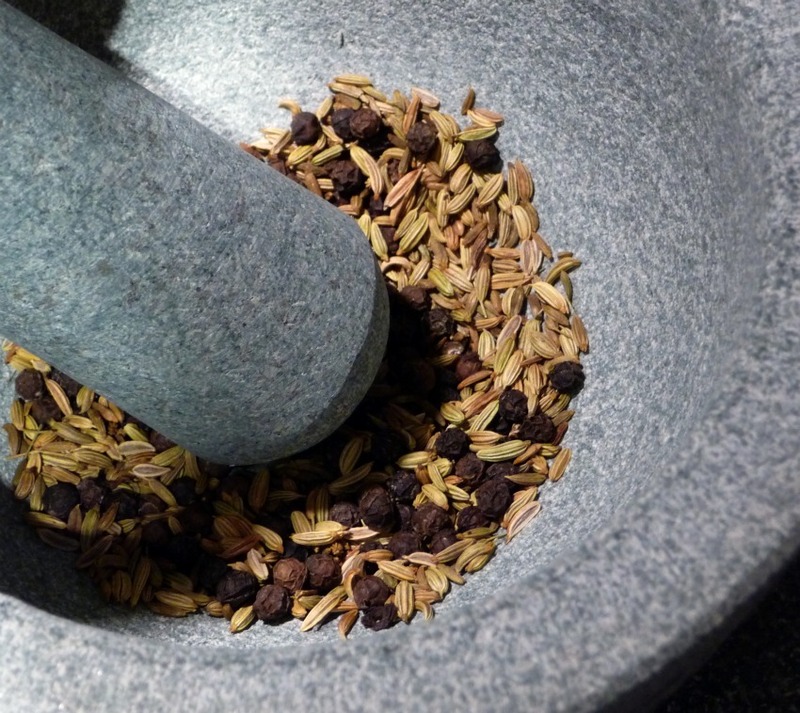 You can find it at specialty food stores or spice markets. 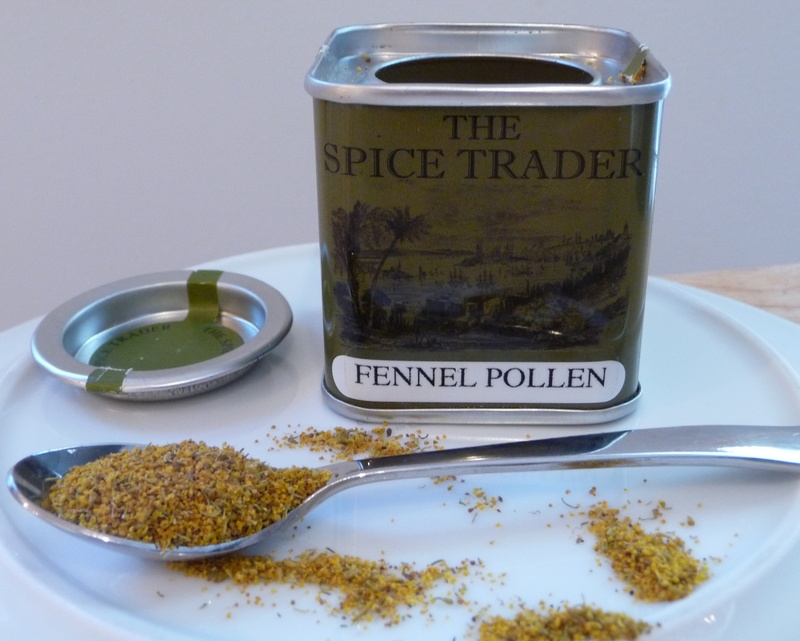 We bought one little jar of fennel pollen a long time ago and it’s lasted a long time because you really only need a little to make a big impact. It’s very pungent and powerful stuff but it’s so good that I don’t know how our kitchen could ever be without it. Neil’s dad actually adds a touch of Sambuca to his fennel when he sautés it (cooking off the alcohol but keeping the licorice-ey flavor), which gives a similar effect and is also delicious. To make this quinoa salad, I pulled together the flavors from the olive salad and the sautéed fennel, and decided that some toasted almonds would be the perfect addition to bring it all together. In my opinion, they made the dish. I was so happy with the way this turned out. It was savory and a little sweet, salty and crunchy. You can serve this hot or cold, but I preferred it cold served as a salad. 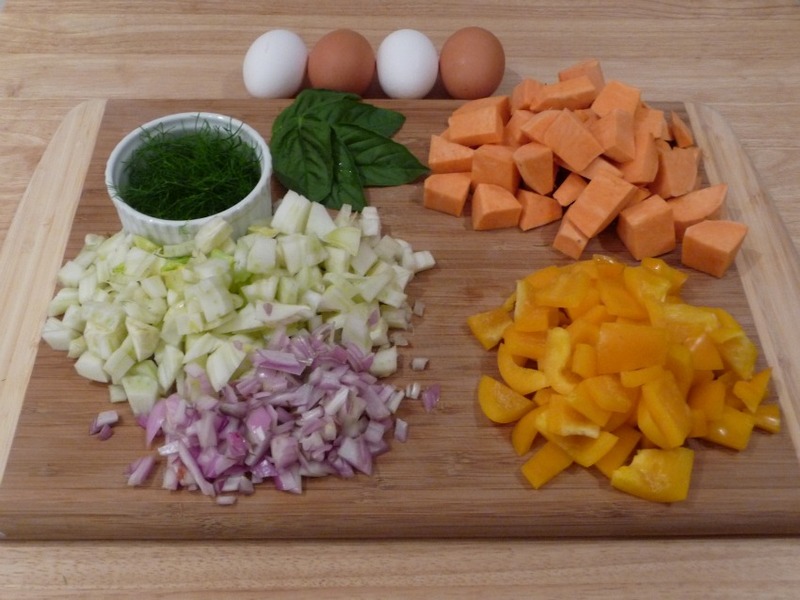 It makes a perfectly balanced and filling lunch or a great side dish. 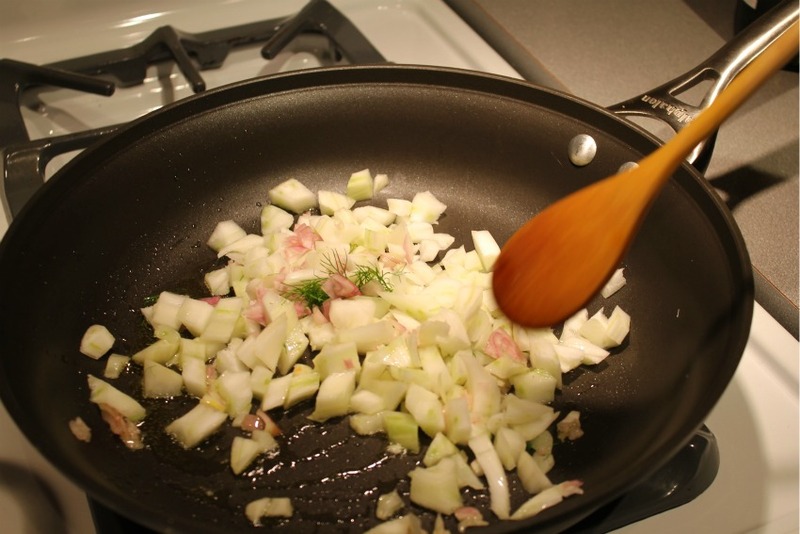 Heat a good amount of olive oil in a pan and add the chopped fennel. Sautee for about 5-10 minutes, until the fennel gets very soft and caramelized. 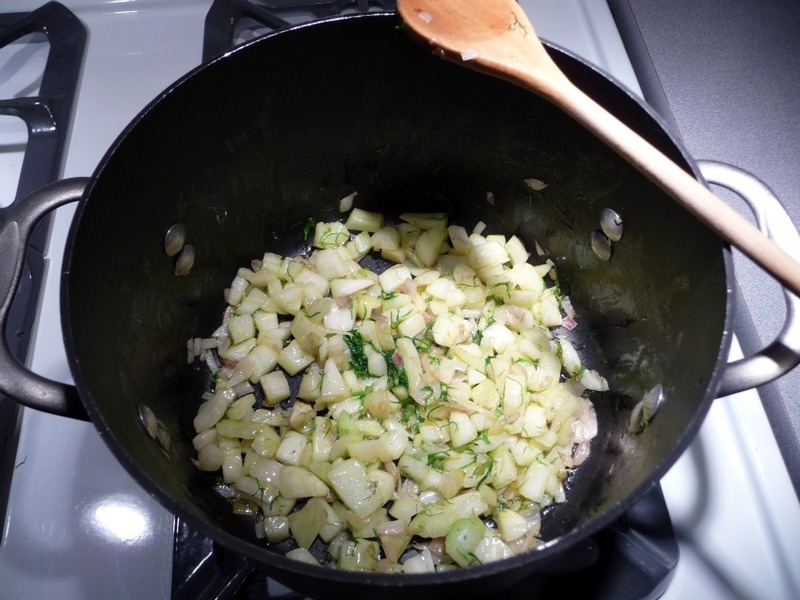 You can add a bit of water or white wine and cook it off to help the fennel soften. Add some salt as it’s cooking. 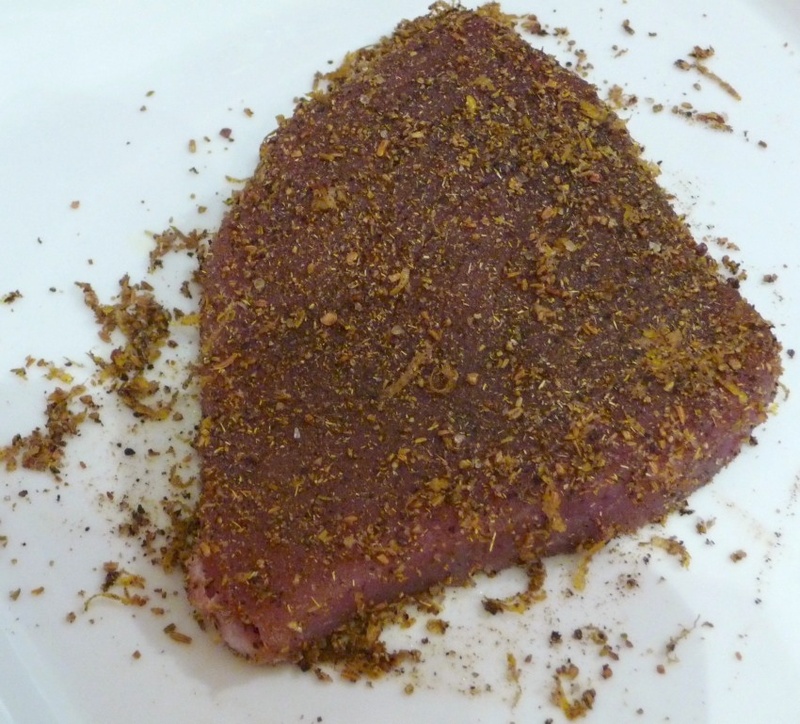 Once it’s cooked down and soft, sprinkle with some fennel pollen, mix and let cool. 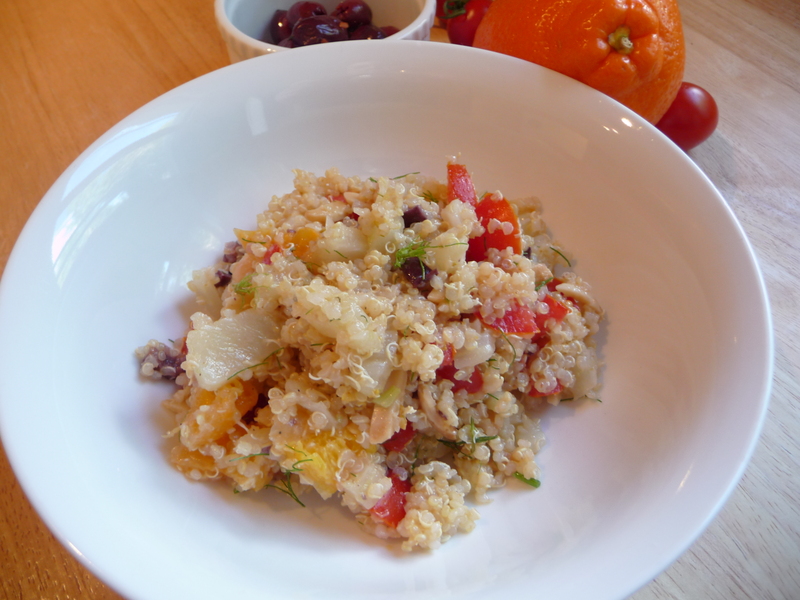 Once your cooked quinoa has cooled, add the tomatoes, orange segments, olive pieces and toasted almond slivers. Add in the cooled fennel. 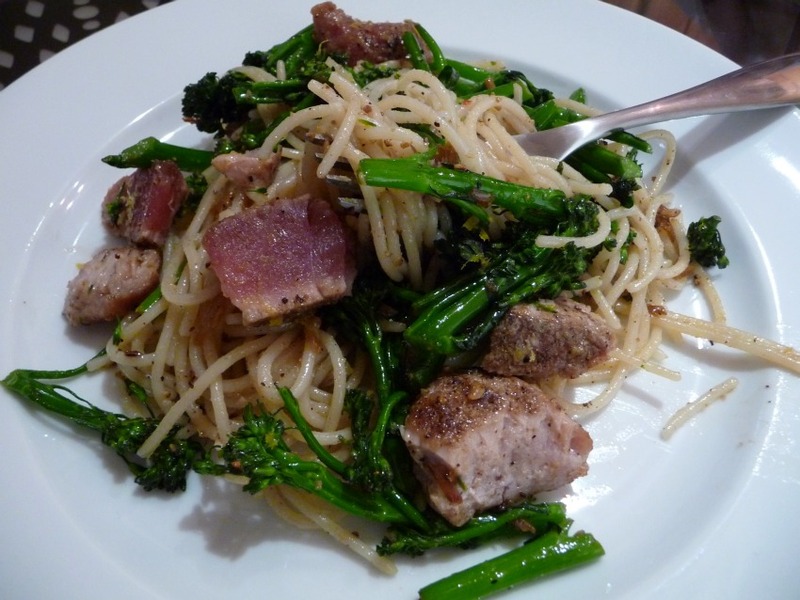 Drizzle with olive oil and a squeeze of lemon juice. 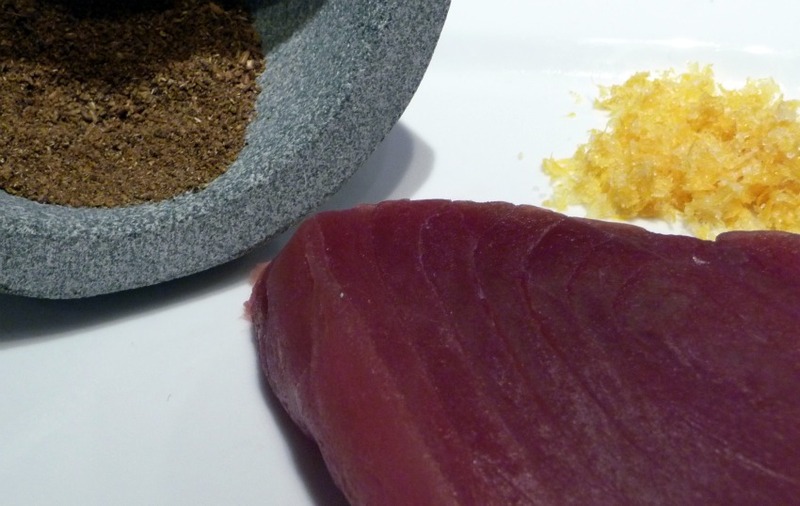 Add a bit of apple cider or rice wine vinegar (to taste, really) and some coarsely ground sea salt. Add a bunch of fennel fronds to top it off – they add a hit of bright green and some extra fennel-ey flavor. C’est tout! You can refrigerate to let the flavors come together and serve cold. It actually tastes even better after a day in the fridge.